A former regional daily sports editor who went on to become mayor of the town he served has died aged 68. Tributes have been paid to Martin Hunt, who worked at several newspapers across Essex during his career. He was also well-known in local government, spending 28 years as a councillor in Colchester and serving as the town’s mayor from 1999 to 2000. Martin began his journalism career on the Southend Standard, before joining Essex County Newspapers as a Chelmsford Crown Court reporter. He moved to Colchester when Quenton Winch, then editor of the Essex County Standard, decided to take him away from court and bring him into the newspaper’s office. Martin went on to become sports editor for the Colchester Daily Gazette before working in the Essex County Newspaper’s central publishing unit. 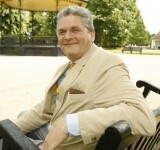 Away from journalism, Liberal Democrat Martin was first elected to Colchester Council in 1983 and held his seat until his mayoral year, when he did not canvass for re-election due to the non-political status the role is given. Three years later, he returned to office and served as the authority’s deputy leader for six years. Prior to standing down in May 2015, he spent his final year on the council as its leader. He had been diagnosed with cancer early in 2015, and passed away on Christmas Eve. Following Martin’s death, the authority’s flag was flown at half mast from Colchester Town Hall as a mark of respect. Martin is survived by wife, Rita, the couple’s twin daughters, Laura and Caroline, and granddaughter Deanna.